At HAVOX®, we believe the product photography process doesn't have to be complicated. We have made it our mission to make taking beautiful, high quality product photos easier than ever. Designed for users of any skill level, all of our photo studios help you create professional quality images from the convenience of your own home or office. With a variety of sizes and lighting options, we give you the ability to choose the perfect photo studio to cater to your photography needs. The real difference in our photo studios are our premium SMD LED photo lights. This lighting allows you to take vibrant professional photos at a much higher quality than photo studios using neon or fluorescent lights. The HPB-80XD model boasts 240 SMD LED photo lights, a color temperature of 5500k, a luminous flux of 26,000 lumens, and a Color Rendering Index of 93+. For maximum quality with this model, we recommend taking pictures of objects smaller than (L)23.6" x (W)23.6" x (H)23.6"
Our goal is to make it as simple as possible for you to take commercial photos with a professional result. As a result, we have included a a detailed user manual that makes it easy for you to adjust your camera to gain the best picture quality quickly and effortlessly. We also know that not all products are the same. That's why we have included features such a several openings at the front and top, light diffusing fabric for shiny objects, and 3 different background shades, giving you the ability to customize your photo studio to best suit your product. 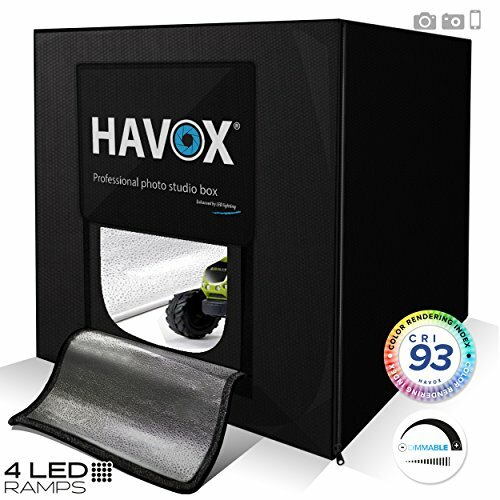 HIGH QUALITY DIMMABLE LED LIGHTS: The Havox® photo studio is equipped with 336 special Dimmable SMD LED Photo lights which offer the perfect amount of light for producing bright and vibrant photos. The SMD LED Photo lights feature a color temperature of 5500k, a luminous flux of 26,000 lumens, and a Color Rendering Index of 93+. These premium lights make it easy to take professional looking photos with a much higher quality than photos produced with neon or fluorescent lights. EASY TO USE: The Havox photo studio is the perfect solution for taking commercial photos with a professional result. Designed for users of any skill level, our detailed user manual makes it easy to adjust your camera and create high quality photos quickly and effortlessly. SIMPLE ASSEMBLY: This photo studio is designed to be both lightweight and sturdy while only taking 10-15 minutes to set up - no tools needed! The photo studio also includes a convenient carrying bag that makes storage and transportation a breeze. MAXIMUM OBJECT SIZE: For the HPB-80XD we recommend taking pictures of objects smaller than (L) 23.6" × (W) 23.6" × (H) 23.6" to ensure uniform illumination. If you have any questions about this product by HAVOX, contact us by completing and submitting the form below. If you are looking for a specif part number, please include it with your message.